It is generally be1ieved that Savarkar was a rationalist, despite his belief in Hindutva. He advised the general public of India, more particularly Hindus that Vedas, Upanishads and Puranas are good literature but not guides. They should be kept in the cupboard as pieces to look good. Even Bhagwad Gita allegedly dictated by Lord Krishna was a piece of literature and only expounded what he regarded as a good guide. It described four phases of man and we are free to follow any one as the pathway to God. In short, he did not believe in the supernatural. On these and other grounds Maharashtra Andhashraddha Nirmoolan Samiti has hailed him as a great social reformer of Maharashtra. If one reads the piece on Savarkar, he is in fact, regarded as a rationalist of Maharashtra on par with Gadge Maharaj, who tried to teach people to clean Maharashtra - even personally sweeping the land and bylanes of the city and villages. He in his own language admonished the people to lead a personal good life. Gadge Maharaj never invoked God for the social reform he preached and in fact did not personally practice any rituals. He took a broom in his hand and set an example of how and why the streets and public places be swept. This was not the rationalism of Savarkar. Though Savarkar advocated that meat prohibited for the high caste Hindu, should be eaten by them. No food was prohibited by Savarkar. Savarkar’s advocacy that Hindus should eat meat was based upon the belief that meat has strength. But it was a myth, because he forgot that an elephant, though so huge was strictly vegetarian and if an occasion was available to it, it could also lift a lion (who was a strict nonvegetarian) with his trunk and injure or kill it. The lion could attack and kill an elephant more because of his agility and mobility. But Savarkar was right in the absurdity of the ban on meat. Meat was a taboo to orthodox Hindus because it was animal food. No food was prohibited, according to Savarkar. Food should he chosen on the basis of its nutritional value and not on the basis of religious edicts. He might even have ridiculed the Muslims and Jews for prohibiting eating of pork because the people of Kodagu (Coorg in English) eat it as a regular food item. To Americans, English and even Europeans, no food is prohibited. Africans also eat almost any food, scarcely barring some. Despite being born in a Chitpawan Hindu family (a sect of Hindus), Savarkar advocated or at least did not prohibit eating meat. But should he be regarded as a rationalist for this? It would be a very narrow conception. Hitler was a vegetarian. Akbar was a vegetarian. A group photo of people accused in the Mahatma Gandhi's murder case. 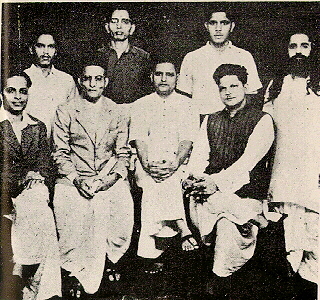 Standing: Shankar Kistaiya, Gopal Godse, Madanlal Pahwa, Digambar Badge. In this connection, it is interesting to note that M.N. Roy, the great rationalist, persuaded Virendra Chattopadhyaya to eat beef in Germany. Roy told Chattopadhyaya that Hindus forbade eating cow’s meat (beef), in India, not in Germany. So one can safely say that, Savarkar was a rationalist in matters of food. That is not all. Because Savarkar said although the Vedas and Upanishadas are Hindu scriptures, no one reads them. Therefore, it is said that Savarkar was a rationalist. Normally if a person’s source of knowledge is articles in a book, he is not a rationalist. Similarly, one who regards a person or a book holy can never be a rationalist. It is perfectly in order that a rationalist or even a common man should reject Vedas and Upanishads. Puranas do not teach any moral lesson. Shambhuk episode, Wali incident, Sita’s totally unjust Agnipariksha and some other features make Ramayana unacceptable. Mahabharat is still worse. There are many persons in Mahabharat who were not born legitimately. Of course, this is imagination but the bulk of Hindu population believes in them, as they are entertaining. Due to their entertainment value and because of technical and other reasons they attracted audiences on T.V. on Sunday mornings. But Bible was a failure in this predominantly Hindu kingdom. One can speculate how a serialization of Quran would fare. Of course, the rationalists regard them as myths. The three books mentioned are no doubt figments of imagination for the rationalists. It is not mentioned that Savarkar condemned these as wrong on ethical grounds or any of the Puranas on any other ground. Rationalism as an appellation can hardly be applied. Ramayana, Mahabharata are good entertainment stories, as Arabian Nights but no human being should and can use them for self edification. There are so many irrational propositions in them, which no rationalist can accept. Puranas come in the same category. Probably they were composed in the third or fourth century to arrest Buddhism and Lokayat. Upanishads are a different story. Though they are attached to Vedas, they contain theoretical discussion and not one of them has canvassed that God exists. Even Kathopanishad and Brihadaranyak Upanishads do not advance the theory of theism. A rationalist cannot believe the Vedas. Rigved and Yajurved contain at places such unrefined passages which are not brought to the notice of the believers. Even Atharvaveda and Sam Veda do not contain any educational material. Rationalists study them but by no stretch of imagination can accept them. Savarkar in his voluminous writings examines them but does not condemn them. As such, he might be a normal Hindu but definitely not a rationalist. The literature to which I have made reference so far does not contain any law that might have governed the Hindus. Sometimes as Ram Shastri Prabhune says, they might have been weighed as Hadith; sometimes a story, here or there, attributable to God or Gods might have given guidance or even wrong guidance. For example, Shambuka episode earned for Rama the Sobriquet Purushottam from Agastyamuni, one of the eight Rishis who were the preceptors of Rama. Unfortunately, some of the Hindu kings thought they were following Sanatana dharma by behaving according to these irrational, incoherent and even unjust laws which endorse beheading of Shambuka (a Shudra youth) by Rama. They cannot he called rationalists. But the book which acted as a law book for Hindus, like Savarkar, was a Smriti called Manusmriti. Even till 1956, the Courts, including Privy Council, accepted the law propounded by Manusmriti as the law of Hindus. It is the most irrational book which should not have seen the light of day. No rationalist could accept the legal propositions that the Hindus were expected to follow. Did Savarkar condemn the book? No, he even praised the book and said the weakness of the Hindus was cause of not following the book. Remember this was before 1956. There is no book in the world which treats the so-called Shudras and women as contemptible and untouchables as inhumanly as Manusmriti. I venture to think that the Hindus believed in Manusmriti and accepted it is the reason why India has not produced a single philosopher after Sankaracharya. There were only Bhaktas like Tukararam, etc. but not thinkers or philosophers. Many of the Bhaktas, it seems, were, schizophrenic. All Bhaktas were not of the same hue. But Hindus accepted all of them with equal reverence. There is not enough space here to enumerate all the irrationalities of Manusmriti. But it is sufficient to remember that Manusmriti tells us that the woman in her childhood depends upon her parents, in her youth or adulthood on her husband and in her old age on her children. No woman deserves freedom, women’s sensual pleasures must be kept under control, the man is the one to whom the woman adheres, a woman should get a loaf of bread, a seat and ornaments. F) The son of a Brahniin from a Shudra woman inherits no property. There are more ‘gems’ like these in Manusmriti which no rational man can endorse. But Savarkar did. Read this in Savarkar’s Samagra Sahitya (original in Hindi). “Manusmriti is that scripture which is most worshipable after Vedas for our Hindu nation, and which from ancient times has become the basis of our culture, customs, thought and practice. The book for centuries has codified the spiritual and divine march of our nation. Even today, the rules which are followed by crores of Hindus in their lives are based upon Manusmriti. Today Manusmriti is Hindu Law. That is fundamental.” (Emphasis provided.) Savarkar was addressing a joint conference of Hindu Mahasabha and RSS. Savarkar has a reputation of being the leader and mentor of Hindus. Untouchahility was a part of Hindu Dharma. Ambedkar fought against it all through his life and ultimately embraced Buddhism. No religion or society in the world (except Hindus) has sanctified untouchables. Savarkar was not averse to untouchability, though later he established Patit Pavan Sangh in Ratnagiri. It has never traversed beyond Ratnagiri and Pune. Untouchability is regarded as a curse by all (except Hindu Mahasabha and RSS). Even Mahatma Gandhi condemned it, though he could have been unwilling to exclude them from the Hindu fold. Untouchables were regarded as ati-Shudras but outside the pale of caste-system. Gandhi would have probably accepted them in the Shudra caste. Thus, he was not in favour of unqualified entry of Harijans in temples as Ambedkar had launched in Kalaram temple; Kakasaheb Gadgil participated in Parvati in Pune and Senapati Bapat, in general. On 20th June, Savarkar again guaranteed that the Hindu Mahasabha shall not enforce any legislation regarding the entry of untouchables in the ancient temples or be compelled by law for amending any sacred ancient and moral usage or custom prevailing in those temples. In general, the Mahasabha will not support any legislation, which may be thrust upon it. While considering the reformist views of the Savarkar brothers, so far as personal law is concerned, let alone a rationalist, was Savarkar even a reformer? I have already mentioned above that Savarkar never made efforts to ameliorate the condition of untouchables. Though he founded the Patit Pavan Sangh but with Bhagurkars Patit Pavan Sangh untouchables remained untouchables. Hindu Mahasahha as an organisation did nothing for untouchables. Savarkar opposed, as mentioned, the entry of untouchables into temples. Gods of caste Hindu temples were surely, the Gods of untouchables too, but the latter had no access to them. Laxman Shastri clearly advised Gandhi that untouchabilily had no sanction of Shastras. Savarkar never endorsed this view. This is the inhumanism of the rationalist Savarkar. In the same place he mentioned that Hindus would he in the dominant position. Dominant in what, say—more taxes, more posts etc. Savarkar says nothing about it. Rest of the speech is confusing and incoherent and at least needs no examination. A nation is always based upon territory. Muslims, as a nation in Savarkar’s confession, would occupy a territory. Then where is Akhand Hindustan (undivided India)? This is the Hinduism or nationalism of Savarkar. That Savarkar was opposed to Quit India movement need not be held against him. Consistent with this view he advised Hindus to join armed forces “not to defeat fascism but to strengthen Hinduism.” In fact, he chided Nehru for opposing fascism for, according to Savarkar, Hitler and Mussolini knew what was best for their countries. I have given enough material to show that Savarkar was not a rationalist. He was communal. I do not hold against him that he was acquitted in Gandhi murder case. The government did not appeal against him. Being a lawyer I would say, agreeing with the Supreme Court, that he was doubly innocent. We have gone through your blog. Interesting. Though we do not agree with your opinion on a number of issues you have touched upon in your blog, Ganesh Babarao Savarkar definitely seems to be more "veer" than his brother. Apart from that, what we have found missing in your writing is the source of your facts. We are not saying that the facts you quoted are wrong. Nothing of that sort. But, since your blog highlights a lot of historical events, wouldn't it have been better had you given proper references; that is, the source materials? The only reference we have noticed in your blog is Blunt's "My Diaries". But here too, though you quote the Volume and Page Numbers, you haven't given the year of publication and the name of the publishers, which are crucial information in any reference. Sawarkar was a rationalist although he tilted to Hindutva later. Who lese could have said, 'Mantra navhe yantra' (We need machines & not Mantras), 'Gay ha ek yupukta prani aahe, devata nave' (Cow is an useful animal but no God). He admired parts of manusmriti but the same time he asked to leave out parts of it. he never said it was timeless & must be followed fully.